We are an all-volunteer fire company, organized under the Bellefonte Fire Department which consists of the Logan Fire Company #1, Undine Fire Company #2 and Bellefonte EMS #26. We proudly serve the Borough of Bellefonte and portions of Benner, Marion and Spring Townships-- also providing mutual aid to communities throughout Centre County. 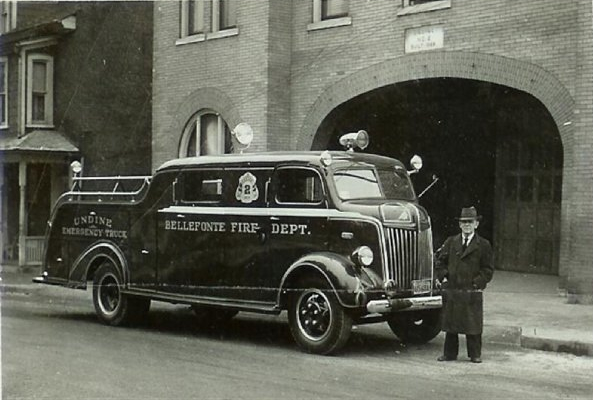 Bellefonte, Pennsylvania is a historic, Victorian town which contains a number of unique fire-service challenges. Several of Bellefonte's structures are old 19th-century buildings which have never been retrofitted to current fire protection standards. 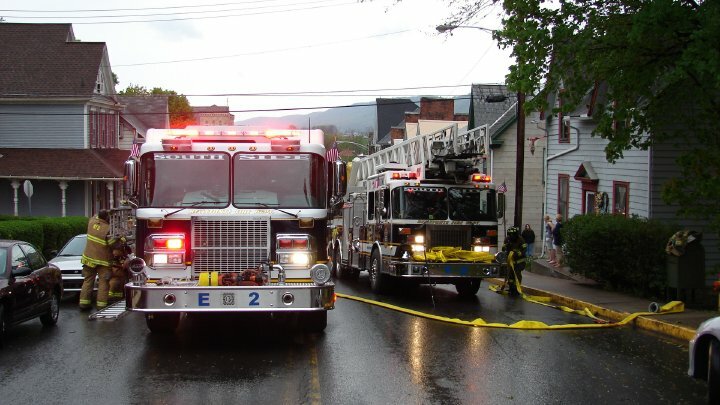 As a result, the Undine Fire Company has recently battled several large blazes at the Academy Apartments, the Bush House, and most recently the Dode Hotel & Garman Theater-- all prominent architectural fixtures in the Bellefonte community. Despite these challenges, the Undine Fire Company is prepared to protect the life and property of the citizens of Bellefonte, Pennsylvania. Undine Hose was organized in August 1871, and obtained its charter on December 9th, 1871. Daniel Hastings (future Pennsylvania Governor) was the original president. John G. Love (later a distinguished judge) was its first secretary. The company immediately arranged to build their 'hose house' at the corner of Perry Alley and Bishop Street , and bought their hose carriage from Neptune Hose Company of Philadelphia . They also purchased a hand engine from Parson & Son, Lock Haven, supplied with six hundred feet of hose. During the 1870s, a great rivalry existed between the Logan Hose Co and the Undine Hose Co. This resulted in quick response, as each company would race to be 'first' on scene. Far too often, though, the companies would swiftly arrive at a fire only to find that the Borough water system could not provide adequate water until they started the steam pumps at the spring, and the water pressure built up to a point that sufficient water could be trained on the fire. As a result, both companies would race to a fire with a full complement of equipment, only to stand by and watch the building burn to the ground! In 1875, the company was reorganized and remained in existence until 1885. The terrible fire that winter destroyed their quarters on Bishop Street and the company again practically disbanded. By 1885, the Borough agreed to take over the maintenance of the department and both companies were placed under direct control of the council. The Undine Co. building, with its engine and carriage, were sold, and the location of the company moved to East Logan Street . New engines and other supplies were purchased at this time. This continued again until December 1891, when a new company was formed. In the 1890's the purchased and paid for a large Clappe and Jones steam engine. The company's 1895 equipment consisted of engine, hose carriage, hose cart, supply of hose, gum coats and boots. Near the end of the nineteenth century, so many disastrous fires had occurred in town that the council again organized the department, creating one ahead and placing both companies under its management at fires. In 1898 the Undine Co. purchased a lot and built a new building on Bishop Street (present location). The borough assisted the Undine Co. in its acquirement of a more modern engine. In 1914, with what would be considered the opening of the 'motor age', the Undine Fire Co. purchased an automobile with which to transport its chemical apparatus and hose. By 1920 a further reorganization was made in the following year, they were fully motorized. In 1964, the Undine Fire Company fell victim to its own tragedy. The existing fire hall at that time caught fire and was destroyed. Despite the efforts of the firefighters, they were unable to save the firehouse from complete destruction. The only item salvaged was the bell from the original bell tower which now resides in front of our current station. In 1966, the Undine Fire Company moved in to its current headquarters. Currently, the Undines have a full complement of apparatus to successfully function as an Engine/Truck Company.